While in residence at ‘All that We Are’ in Hobart I went to the Hobart Gallery and Museum’s “The National Picture - The Art of Tasmania’s black War”. 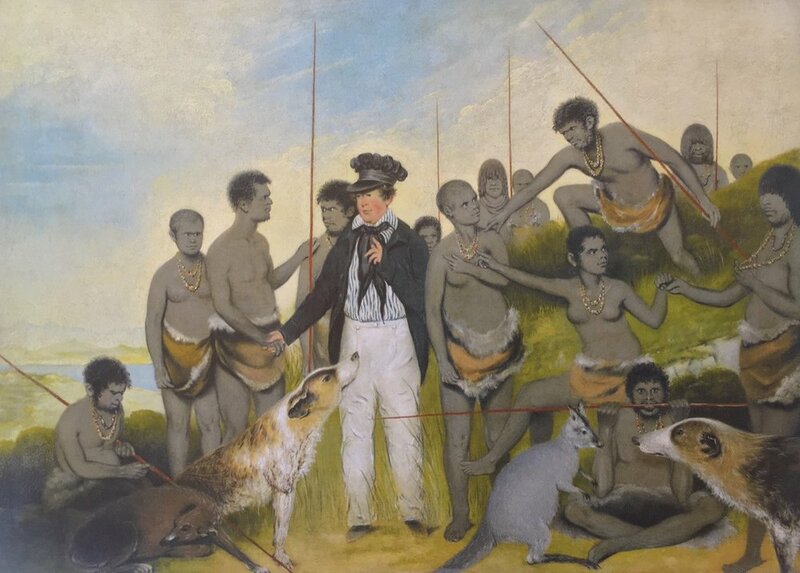 The exhibition is built around Benjamin Duterrau’s painting The Conciliation – showing George Robinson meeting with the Palawa - local Aboriginals, to end resistance and accept government protection. The Museum of Australian Democracy at Old Parliament house recognises this painting as one of Australia’s founding documents. This “Friendly Mission” by Robinson and the Palawa people Woorady, Trukanini and others, who travelled the island on a Christian mission seeking out tribes who were resisting colonial expansion. They were successful in persuading hostile tribes to give in and accept government protection – giving up their land and moving to Flinders island (a move thought to be temporary). This ended the Black War. With this exhibition is the work of Thomas Bock who was commissioned to paint 14 local Aboriginals. Of course having just spent a year painting portraits of Aboriginal people today who I see as champions of their culture I was fascinated. What was going on when Bock an ex convict painted the portraits? Paintings from this period of decimation of the local inhabitants by British forces and settlers show the gross discrepancy between rhetoric and reality. The locals both call for land at any cost and others are appalled by the measures taken. As you can see from the timeline I have constructed (in order to get it straight in my head) things were out of control and high ideals and land grabbing were at constant odds. What really grabbed my attention were the Proclamation boards showing equal treatment for black or white and an integrated society - how could these boards have been hung in public at the same time as the black war? Van Diemans Land -Tasmania was settled in 1803. By mid 1820’s settlers and land grants have increased and conflict between settlers and original inhabitants is spiralling out of control. 1828 in April the government declares all Aboriginals who entered the settled districts as criminals and could be killed with impunity. The settled districts were not marked. By November this escalated to martial law – effectively declaring war on the aboriginal people anywhere. 1830 the Black Line is staged - 2,200 men at a cost of half the annual budget of the colony 30,000 pounds were to drive the Aboriginal population from settled districts to Forrestier Peninsula and then to be sent offshore. Only 2 people were captured. The Aboriginal population of 6,000 at settlement was now down to a few hundred - They still resist. 1831 Field Map of the military operation of the black line (above) is published in England. Showing belief that the English straight line could dominate even topography - the militia groups were undisciplined and didn’t move in a coordinated line. 1828 Robinson is appointed to convert a ration station on Bruny Island as a mission to civilise the Aboriginal people. It was a failure with many dying from disease. Despite this, Robinson convinces Arthur to support his more ambitious plan to move Aboriginal tribes in stages to Flinders Island for two years while things settle and then bring them back. 1829 Frankland the surveyor who in his travels noted Aboriginal paintings on trees and in huts (including pictures of colonists) had the idea of using this pictorial method to influence both Indigenous and settlers (who were often illiterate). The picture boards refer to L-Gov Arthur’s proclamation and show black and white families arm in arm, black women holding white babies and white women holding black babies, and that punishment for killing was killing regardless of skin. A story of integration. 1831 Robinson meets with the Big River mob (a group of numerous clans who have held on to living on the land) to effect their surrender. The Oyster Bay mob are also brought in. 1833-4 Duterrau paints large portraits of Aboriginal people in oils. 1840 Duterrau’s painting of ‘The Conciliation’. He referred to this as preparation for a later painting ‘The National Portrait’ that he apparently sold to a scotsman but no image of it exists. 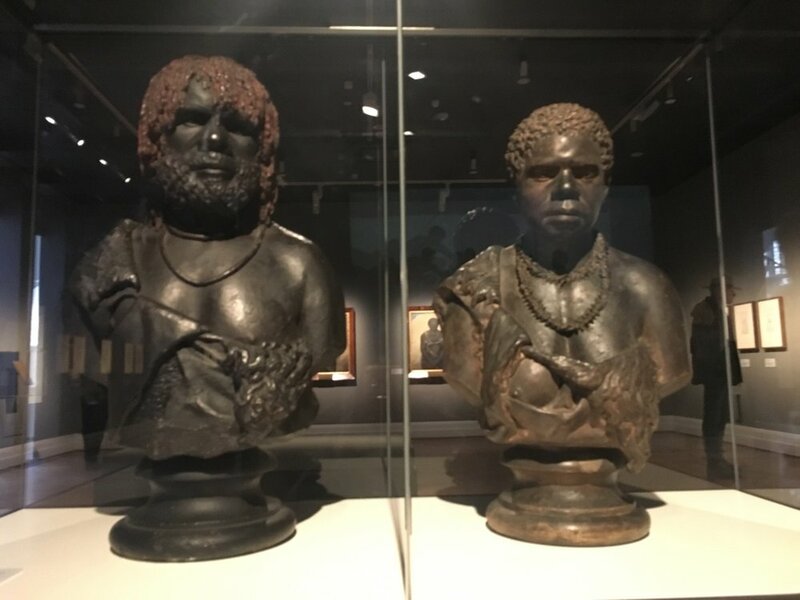 Despite killings for 25 years, the Black War, disease and maltreatment the Aboriginal people of Tasmania would not give in – they fought a bloody war for their land and their people. The conciliation meetings, commissioned and paid for by the government of the day represent a treaty to end that war. Neither the war nor the treaty are recognised in our history. The War Memorial in Canberra should hold this picture. Robinson later came under criticism for duping the Palawa – they were never returned to the mainland but died of disease and starvation. Although many Aboriginals had been gathered up from the sealer’s islands during the ‘Friendly Mission’, fortunately some were not. I want to take this opportunity to explain who this exhibition is dedicated to and why. Marlene McAuliffe was the best of friends to me for over 30 yrs, enfolding me into her family. Marlene died in 2017. She was a person who valued friendship; who listened; who was curious and loved beauty; who made each person she spoke to feel important and cherished; who made friends into family. Those of us who new her know that we were lucky, that our lives are richer for it and always will be. Marlene's spirit embodies what this exhibition is about. Being curious, seeking beauty, being willing to learn, to cherish and to welcome. This time last year I had not even conceived of anything like this exhibition. It is exciting to see the exhibition up looking beautiful . Tiffany came and photographed the portraits for the exhibition booklet and for the posters on each floor of Deloitte Melbourne that showcase the portraits and their stories. Clients at the Deloitte visitor Centre are giving great feedback. People are learning more positive stories about Aboriginal culture in action today. David, Anthony and Simon doing a great job of hanging Keys To Our Country for NAIDOC at Deloitte Melbourne L10, 550 Bourke St. The portraits have the story of the person painted posted next to them and a QR code so the viewer can watch the time lapse video of the picture being painted and listen to the singing of that person or music by Gordon Harvey and Aquiline. As I have said before reconciliation is complex. One part is recognition of history as it happened. The part this exhibition focuses on is on applauding those Aboriginals who are helping us build stronger futures through bringing their culture into their work and being open to helping the broader community learn more about Aboriginal Culture. I hope that more people will take an Aboriginal Heritage Tour at the Botanic Gardens, or the Museum, or seek out books like Bruce Pascoe's Dark Emu to learn more about history as it happened. Learning more about the land on which we live can have unexpected benefits. Try it - you won't be disappointed. My thanks to Deloitte for their generosity in hosting the exhibition and joining their RAP - Reconciliation Action Plan, with mine. Special thanks to Adrian Gardiner and Rob Pluchinotta for their energy and great work in getting the exhibition up. May their community actions go from strength to strength. The paintings are for sale at 32Auctions.com/keys with the profits going to Yalari for Aboriginal Education. Savouring the moment with Den's portrait just as we finished hanging the exhibition. Well, we are almost there. I am on my twelfth portrait and have to have them all ready for being photographed by Tiffany on the weekend. Really I couldn't have worked any harder but nothing could have been so rewarding. I have met such amazing people and learned so much about Aboriginal culture. This is my RAP Reconciliation Action Plan. I hope it inspires others to embark on their own. If only to be curious and learn more about our Aboriginal culture and shared history. Deloitte the international Financial and Consulting Services Firm are hosting the Keys To Our Country exhibition in NAIDOC week here in Melbourne. The Exhibition will go up at the start of July. Currently the portraits are getting framed and we are in event organising mode with a wonderful Team at Deloitte from their RAP committee organising the event. I'll keep you posted of the official details soon. Presenting Waverley Stanley's Portrait to his yr 11 Yalari group at Queens College Melbourne. What a journey this has been. I have met such amazing people. It has been wonderful. Waverley Stanley's wife Llew saw my email asking Waverley to join the project and we met almost the next day. I presented his painting to he and Llew and the Yalari yr 11 camp at Queens College in Melbourne. The kids faces lit up as they clearly love Waverley so they loved his portrait and the fact that they were all the little Bunya pines that he is planting. Coincidences continue to drive the project - or as Den tells me the old people are watching. Like my choosing Bunya pines for Waverley's painting and it turning out to be his peoples special tree. Waverley introduced me to Uncle Moogy in Adelaide and he invited me to a corroboree. My brother Peter and I went down to Dupang on the Coorong and I was blown away by the stories of how Uncle Moogy and dance have touched and change so many lives. His energy to share and teach shows seemingly endless compassion. I was singing jazz with Caz Mclennan and she connected me to the beautiful Veronica Barnett from Torres strait and Cape York and her wonderful weaving and art. From that meeting flowed the intro to Tiffany Garvie award winning photographer from Arnhem land. We roamed the lanes of Brunswick looking for good graffiti at sunrise. As I was painting Veronica live in the Melbourne Museum I found myself surrounded by children from the Kimberley and people doing a Wayapa course - go figure! 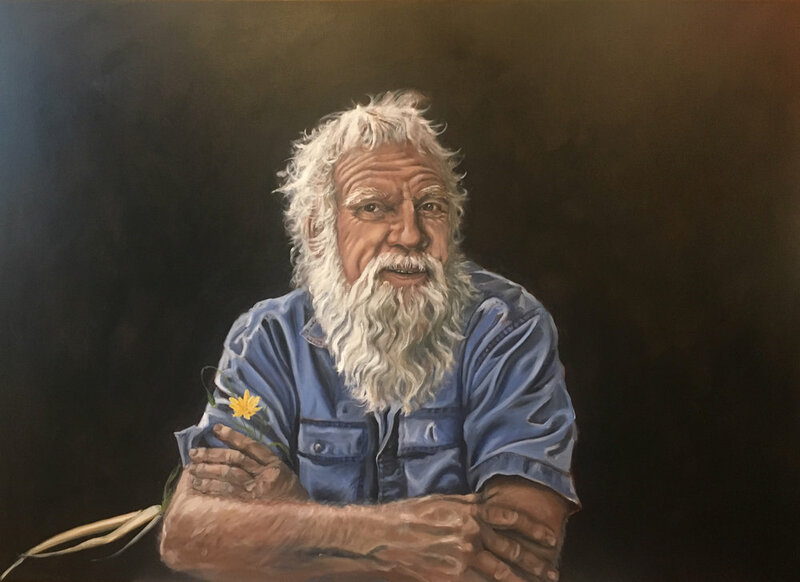 The teacher of the Kimberley group was Tyrone Bean, the first Aboriginal teacher at Wesley College, an activist in Australian rules footy and first Aboriginal Support person at Queens College. Jamie Marloo Thomas who runs Wayapa had been at the Dupang festival but I just missed him. Tiffany recommended him and I am now learning about Wayapa Wuurrk the Aboriginal Wellness program. Wayapa Wuurrk is going from strength to strength with more and more qualified instructors all over the country. Having lived at a Dojo in Japan, done courses with the North American Indian Shaman I am excited to find the healing arts from my own country. Seeing the Ngangkari healer from the APY lands was one of the things that got this project going. I am just finishing Tyrone and Jamie's portraits off this weekend before I head to Adelaide to develop my painting skills with Robin Eley. The day I get back I will meet with John Patten, incredibly talented, artist, writer, playwright, manager and life long learner. I need more women on board, so hopefully will meet the right ones soon. Please tell your friends about the project and help grow the Keys to Our Country Community. Bruce Pascoe is a crusader. He researches history to tell the right story, grows crops to create commercial futures from native plants, researches language to maintain the flame for future generations and to help them know the strength of who they are. Bruce is an Aboriginal Australian writer, from the Bunurong clan, of the Kulin nation. He has worked as an award winning writer, teacher, farmer, a fisherman and an Aboriginal language researcher. Bruce is the author of Dark Emu. Dark Emu challenges the claim that pre-colonial Indigenous Australians were a hunter gatherer society. The journals of early explorers, newspapers and records show the agricultural scope and sophistication of Aboriginal Australians when the explorers arrived - illuminating our past in order to light the future. Bruce is involved in cultivating murnong yams and other indigenous crops to promote their commercial distribution. Did you know that the first bread was baked in Australia over 30,000 years ago, 15,00 years before the Egyptians used flour to bake bread? Norman Tindale documented aboriginal grain crops covered most of the Australia continent but contemporary grain areas make up less than a quarter of that area. What might happen if we explore those traditional grains and how they were grown in areas we now call desert? There is much to learn from our past to help build a stronger Australian future. "You can't eat our foods if you can't swallow our history." Please have a listen to Bruce as he tells you of the records of the explorers and early settlers regarding the sophistication of crop and aquaculture management. Time lapse video of the painting of Bruce's portrait. The launch of ‘Keys To Our Country’ was a moving and happy event. Den Fisher presided with a smoking ceremony that gave the event gravitas – it drew people in to the meaning of the project – all Australians celebrating aboriginal heritage and being part of that culture. 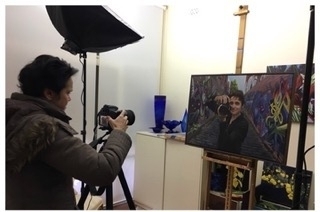 Den’s portrait was unveiled and the project explained to the group assembled. It was very encouraging to hear the comments of support and well wishing. All present were encouraged to sign up to the Keys to Our Country website in order to get updates as each portrait is done. 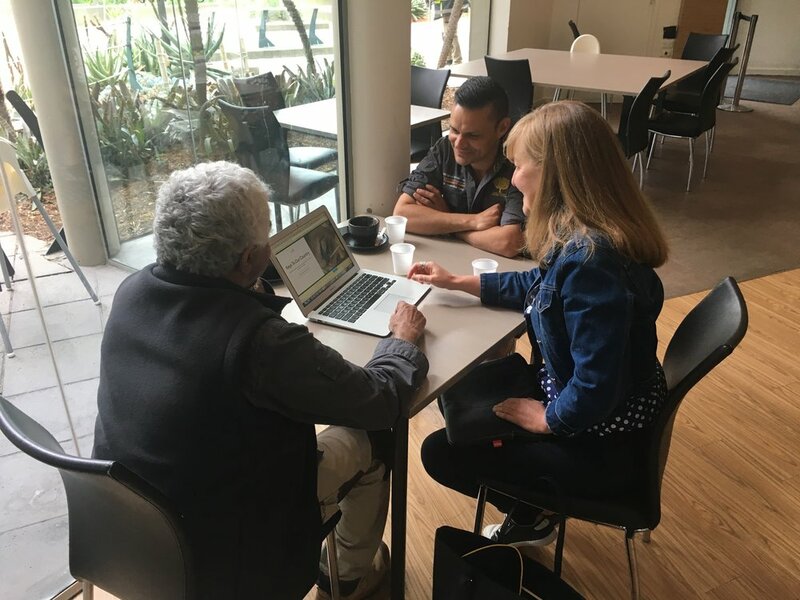 Each update will explain the work of that individual and help us all learn more and be able to create meaningful conversations around the strengths of Aboriginal culture. We all shared lemon myrtle muffins and tea and those congregated took away a Celia Moriarty Art 2018 calendar. There are so many coincidences and stories that collided to make this project begin. 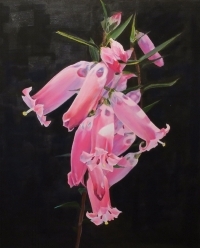 As a painter of Australian Native Flora I am regularly at the Royal Melbourne Botanic Gardens keeping an eye on the new blooms in the changing of seasons. Last summer to my delight the sacred lotus had emerged and bloomed in the lake right by the cafe. I saw some gardens staff and applauded them for this new planting, explaining that I am an artist who paints native flora. Den Fisher then said "paint me". Well I didn't paint portraits, but at that time I enrolled in Robin Eley's oil painting course which turned out to be portraiture. As I applied his tecniques, there was Den's face, so I thought I had best find him again and paint him. I went on the Aboriginal Heritage Tour at the gardens and Ben Church taught us about the three plants used in the smoking ceremony. One to represent the past ancestors who lived on this land, one for today and one for the past. The smoke of all three mingles to cleanse, heal and strengthen. I have learned from my work over 20 yrs as a communication facilitator of issue resolution and persuasive communication that success in these areas is based on connection and recognition. Many people are like me and don't know how to connect to the indigenous heritage of our land because we don't know much about it. Our history books didn't tell us much, but this is beginning to change. I am not an Aboriginal Australian but I am a lifelong learner and educator and applaud those who are helping us learn. When I painted Den's portrait I new through many little signs that I was on the right track. The work Den and Ben do at the botanic gardens teaching visitors about Aboriginal Heritage is important. It seeds many conversations in the broader community. Through learning we build understanding and can begin those conversations that help us to connect our diverse talents and strengths. Without those conversations Australia holds a weakness of not embracing the rich culture of it's past and turning it to advantage. As an artist I can use my art to acknowledge these individuals who are conduits of change and broadcast it further. Please subscribe to the project to learn about the ways dedicated individuals are focusing on what can be done and bringing Aboriginal culture into their work today. I am immensely grateful to the The Royal Melbourne Botanic Gardens for hosting the unveiling of Den Fisher's portrait and Launch of Keys to Our Country the Project on November 1 2017. This is how the portrait begins - with music composed by my friend Gordon Harvey. There are no keys in the portrait at this early stage. When I said to Den I wanted to include them he immediately said - 'I know what to call it - Keys to my country, No, Keys to Our Country. And so it is.